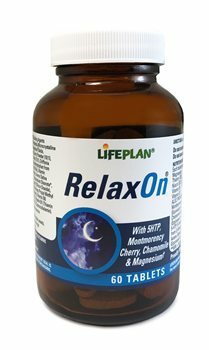 RelaxOn provides 5HTP, with a botanical complex of Avena Sativa, Montmorency Cherry and Chamomile which can be taken before bedtime. Enchanced with the mineral magnesium, it helps the normal functioning of the nervous system and normal psychological function. Montmorency Cherry 10:1 - 150mg (Equivalent to 1500mg of fresh Cherry). Chamomile Extract 10:1 - 100mg (Equivalent to 1000mg of fresh Chamomile). 5-HTP (5-Hydroxytrptophan from Griffonia Simplicifolia) - 75mg. Avena Sativa Extract 10:1 - 10mg (Equivalent to 100mg of fresh Avena Sativa). Bulking Agents (Dicalcium Phosphate, Microcrystalline Cellulose), Magnesium Oxide, Montmorency Cherry Powder (10:1), Chamomile Extract (10:1), Griffonia Extract (5-Hydroxtrptophan from Griffonia Simplicifolia), Vitamin B3 (Nicotinamide), Avena Sativa Extract (10:1), Magnesium Stearate*, Anti Caking Agent (Silicon Dioxide), Clear Coating (Hydroxy Propyl Methyl Cellulose, Glycerol), Vitamin B6 (Pyridoxine HCI), Vitamin B1 (Thiamin HCI), Vitamin B12 (Cyanocobalamin). As a supplement, take one tablet in the evening, preferably with a little liquid. Contains no added yeasts, flavourings, colourings or preservatives.